by Dwight Newman. Oxford: Hart Publishing, 2011. Hardback $100.00 ISBN: 978-1-84113-228-0. Reviewed by Stephen A. Simon, Department of Political Science, and Program in Philosophy, Politics, Economics, and Law, University of Richmond. ssimon [at] richmond.edu. 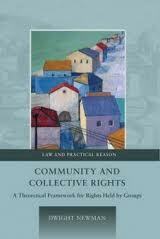 Community and Collective Rights is a book that makes clear what it wants to do and does it. Some books read like collections of essays related to a general field of inquiry. (Not that there’s anything wrong with that – Ronald Dworkin’s Taking Rights Seriously, for example, falls in that category and has been remarkably influential.) This is a different kind of book, though, which presents a thorough, cohesive investigation of a single topic. Regardless of whether one agrees with the author’s conclusions, the theoretical framework is a formidable attempt to tackle a complex problem. If members of an ethnic group were wronged by the larger community several decades ago, are contemporary members of the group entitled to compensation for those wrongs? Is a province with distinctive cultural features entitled to secede from the country of which it presently is a part? Should a religious minority be allowed to continue religious traditions which are in tension with individual freedoms cherished by the wider community? Newman’s aim is not to persuade the reader to adopt specific answers to particular instantiations of these general problems. Rather, he aims, first, to explain why it makes sense to ask these kinds of questions at all, and, second, to provide a theoretical framework for addressing them. What Newman wants to show is that we are justified in thinking not merely that individuals can have rights that derive from membership in collectivities but that collectivities themselves can be the bearers of rights. The book is divided into three parts. The first part establishes the theoretical foundation for why (and when) it makes sense to speak of collectivities as holding rights. The second part describes the conditions that are required for a collectivity to hold rights, and the third part examines how the principles set forth in the first two parts apply in real communities where the ideal conditions for collectivities to hold rights do not pertain. The book’s central concerns obviously have political currency (this October, for instance, the U.S. Supreme Court heard oral argument in Fisher v. University of Texas on whether a state university’s admissions process constitutionally could take race into account). The author guides the reader through a thicket of difficult questions with a sure hand. Each part and chapter provide a road map of the arguments to come. Newman has a knack for addressing potential complications just as they occur to you; he is not one to commit the intellectual sin of ignoring the elephant in the room. He also peppers the discussion with real- [*504] world examples which serve to illustrate the application of his theoretical analysis. At the heart of the book’s concerns is a fascinating puzzle. On the one hand, many of us tend to think of rights as things that individuals hold against other people – possibly against individuals but especially against collectivities and communities. From this perspective, the notion that collectivities or communities themselves may hold rights (as opposed to simply having interests or policy preferences) might seem to undermine the notion that there is something unique about the individual as a moral agent who is particularly vulnerable to coercion by more powerful forces. We may find ourselves at least partially resistant to the notion of “group rights.” At the same time, though, as the book reminds, we routinely treat certain collectivities and political communities as moral agents, as when we think of nations as owing moral obligations or as having acted in morally blameworthy (or praiseworthy) ways. Newman’s project is even more ambitious than the subject of group rights might suggest. His framework is not limited to rights for collectivities that are protected by constitutions or other enactments, but, rather, is offered as an account of moral rights. Moreover, the account is not limited to specified varieties of collectivities; it is meant to apply to everything from nations to sports teams. Newman conceives of rights as rooted in interests. On this understanding a right exists when there are interests sufficient to ground duties (p.10). Although Newman defends the notion that a collectivity (as distinct from its particular members at any given moment) can hold rights, his justification for this proposition does not depend on the assertion that collectivities have any special ontological status. It is not that there are these things in the world called collectivities, which, by their very nature hold rights apart from the welfare of individual persons. Rather, Newman asserts that only individual well-being ultimately matters and, thus, “the value of collectivities resides in their contribution to the lives of individuals” (p.137). This means that a crucial challenge for the account is to explain “how collectivities can have moral status even though only individuals are of ultimate value” (p.31). The author’s strategy for overcoming this challenge does not rely on the assertion that the existence of collectivities generally provides benefits to the society as a whole, such as social diversity. Instead, his basic strategy is to show that recognizing the rights of collectivities follows necessarily from other propositions that presumably the reader more readily will accept. In particular, once we accept that collectivities can carry responsibilities, he argues, we must recognize that they only will be able to meet these responsibilities if they hold certain rights. One example provided is that if a corporation has the responsibility of protecting its employees’ confidential information, then it also must have rights of privacy as against outsiders (p.54). In a similar vein, Newman argues that the existence of collective rights necessarily follows from the existence of certain individual rights, since the latter cannot be protected without the former. An example here is that the “freedom of [*505] religion must include protection of . . . religious collectivities” (p.77). In certain places of the analysis, I found my own intuitions at odds with Newman’s assertions, or had difficulty in accepting the move from one proposition to another. For instance, in making a prima facie case for recognizing the moral status of collectivities, Newman points to examples in which we treat a collectivity as having acted immorally even if no individual member of the collectivity can be said to have acted immorally. Now, it may be practically advisable for laws to hold certain collectivities (e.g. corporations) legally responsible even in the absence of demonstrable individual culpability. However, since I always have associated immoral action with the knowing choice of a moral agent, I am not sure that it makes sense to speak of an entity as having committed a moral wrong if no person can be said to have acted wrongfully. To my mind, there is a difference between an immoral act and a series of unfortunate events leading to an unfair result. I also did not find myself persuaded by Newman’s strategy for showing that collectivities hold rights. Even granting that certain individual rights only can be protected in practice through the recognition of certain legal protections for collectivities, I do not think it follows that we must think of collectivities themselves as holding moral rights. Newman uses the example that the freedom of religion cannot be protected without protecting the rights of religious organizations. To me, though, it seems feasible to approach freedom of religion questions through the prism of whether challenged governmental acts violate the religious rights of any particular individual. To take an extreme example, if a government policy shut down the operations of a religious organization, we would not have to think in terms of whether the organization was the kind of collectivity that was capable of holding rights; we could approach the problem from the perspective of an individual person, while recognizing that many religious freedoms can only be realized within the context of collective rituals and activities. In the end, though, the important point is not whether any particular reader agrees with this or that of the book’s propositions. What matters is that this book not only takes on a politically salient and complex problem but that it presents an impressively comprehensive framework for addressing that problem. Newman’s ambitious account challenges us to reconsider the basis of our views regarding the moral status, responsibilities, and claims of collectivities. Broadly speaking, the book should be of interest to scholars with an appetite for questions at the intersection of law and philosophy. Indeed, the book reads even more like a work in political morality than one might expect from the title. The discussion glides into political philosophy at nearly every stage. For example, in establishing the moral status of collectivities, Newman draws on Dworkin’s account of political community in Law’s Empire. Moreover, in discussing the conditions that collectivities must fulfill in order to to be capable of holding moral rights, Newman articulates the responsibilities that collectivities have towards their own members and towards non-members. [*506] Since Newman’s account is meant to apply to political communities as well as other collectivities, this discussion has implications for accounts of political legitimacy and other vital questions in political philosophy. The book also should be of interest to legal scholars with an interest generally in questions about group rights, or in specific controversies that fall within this arena, as it is packed with illustrative examples drawn from international and domestic law. Dworkin, Ronald. 1986. Law’s Empire. Cambridge: Harvard University Press. Dworkin, Ronald. 1978. Taking Rights Seriously. Cambridge, Massachusetts: Harvard University Press. Fisher v. University of Texas at Austin 631 F.3d 213 (5th Cir. 2011), cert. granted, 132 S.Ct. 1536 (2012). Copyright 2012 by the Author, Stephen A. Simon.